A team of researchers at Zhejiang University in China has used a mathematical model developed by Alan Turing to create a unique type of polyamide mesh. In their paper published in the journal Science, the group describes their process and how they discovered the mesh could be used to filter water. Alan Turing, famous cracker of the German Enigma machine, and developer of some of the foundations of computer science, also dabbled in chemistry. In 1952, he actually published a paper describing a mathematical model explaining how unique striped patterns in animals come about. His math described a process by which two chemicals, when mixed together, take turns interrupting the other's actions. In living beings, the chemicals are hormones that influence characteristics such as stripes on tigers. It was in the different ways the hormones were diffused through the tissues, Alan argued, that caused the patterns. In this new effort, the researchers set out to create a new material based on the model Turning had created. Instead of using biological material, the researchers used a type of polyamide—it is normally made by reacting trimesoyl chloride and piperazine. To make it diffuse in ways described by Turing's model, the team added polyvinyl alcohol. The result was a nylon-like mesh, the features of which could be adjusted by altering the ingredients in the reaction. In one such form, the mesh resulted in a material that looked to the researchers like a filter. Surprised, they tested it to see how well it could remove salt from water. They report that the material was able to filter large types of salt more efficiently than current methods—it allowed less salt through, while allowing more water. Further testing revealed that their unique filter was able to handle 125 liters of water per hour when put under pressure. It also removed approximately three times as much salt as conventional filters. The researchers do not expect the filter will be used in desalination plants, however—filters in such plants must be able to remove tiny salts. But, they note, the filters might prove useful in cleaning manufacturing waste. They note also that their work demonstrates that possibilities exist for using Turing's ideas to make useful products. The emergence of Turing structures is of fundamental importance, and designing these structures and developing their applications have practical effects in chemistry and biology. We use a facile route based on interfacial polymerization to generate Turing-type polyamide membranes for water purification. 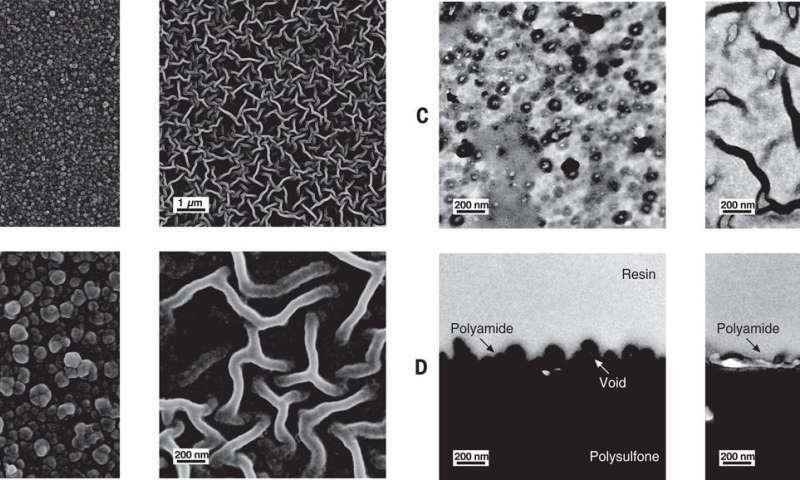 Manipulation of shapes by control of reaction conditions enabled the creation of membranes with bubble or tube structures. These membranes exhibit excellent water-salt separation performance that surpasses the upper-bound line of traditional desalination membranes. Furthermore, we show the existence of high water permeability sites in the Turing structures, where water transport through the membranes is enhanced.